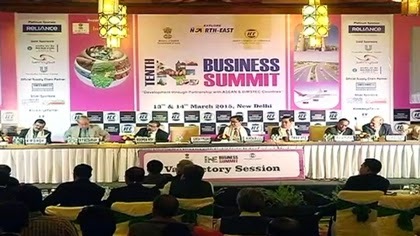 New Delhi, Mar 20 : A wide range of issues pertaining to development, connectivity and investment figured prominently during the 10th Northeast Business Summit. The Northeast Business Summit was organized in the national capital by the DoNER Ministry in collaboration with the Indian Chamber of Commerce under the theme of 'Development through partnership with ASEAN and BIMSTEC countries'. Minister for State for Development of North Eastern Region Jitendra Singh, Union Railway Minister Suresh Prabhu, Minister of State for Home Affairs Kiren Rijiju were among the dignitaries who attended the event, besides the representatives of different industries and ministers from Bangladesh, Bhutan and Myanmar respectively. Addressing the inaugural session, Jitendra Singh highlighted the various initiatives being undertaken by the Centre to bring development in the northeast. Describing the region as the 'Economic Corridor of India', he appealed to the business community to come forward to support the effort to bring development in the northeast. "In today's meeting also, we not only had representatives from top industrial bodies from the country, but we also had senior ministers from the governments of Bangladesh, Myanmar, and Bhutan because we know that we have a potential which if we exploit to the maximum, we would be able to attract investment not only from the rest of the country but also from the neighbouring countries," said Singh. "In fact, the eight northeastern states are an economic corridor and it can earn the distinction of India's most illustrious economic corridor to the rest of the world on that side. We have potential in food processing, organic farming and we have a huge human resource potential in the form of youth energy which has not been exploited to the maximum," he added. M.K. Saharia, Chairman, Indian Chamber of Commerce Northeast Region, said the northeast is attracting investment. "We have been able to attract investment. We have been able to focus the potential opportunities of northeast. There are challenges and we do highlight the challenges at the same time. There has been a lot of interest and few investments that have come up in the northeast," said Sharia. "In terms of traditional industries, there are many investors who have set up cement plants and things like that. But there are many more industries that are likely to come up," he added. The two-day long conclave gave a platform to eminent achievers, government officials, investors and entrepreneurs from a variety of fields to interact with each other and deliberate on various issues related to the region through panel discussions and interactive sessions. Highlighting the region's rich natural and human resources, the various sessions emphasized on the growth potential in various sectors such as tourism, organic farming, connectivity, infrastructure and education. The meet also stressed on the need to facilitate skill development of the youth in the northeast and encourage entrepreneurship so as to utilize the maximum potential. Former chief secretary of Manipur, D.S. Poonia, emphasized that the skill development programmes are essential. "The northeast has this advantage of English literate and literacy being very high. This is something that the new Ministry of Skill Development and the other ministries which impart skilling program can leverage. Over all this country and the northeast has this demographic dividend where we have a large working and young population," said Poonia. "At the same time, what is being churned out by the colleges and universities, they don't have adequate skills. On the other hand, there is a whole lot of emerging skills which we need to take advantage of. So, there is a whole lot of opportunities opening up if we can skill them," he added. Lezo Putsure, an executive member of Youth Net, said it is very important for the government and the young people to harness this energy into something that is productive and that can prosper the northeast. "And the only way to go towards this is entrepreneurship. Look at the domestic stuff that we have-agriculture, buildings, construction, there is so much that can be done and that is why we advocate entrepreneurship because it is one of the main solutions that can lead to prosperity for the northeast," he added. A special session titled 'Youth decide: Youth empowerment in Northeast India' focused on the scope for harnessing youth energy of the region and the need for formulating schemes to encourage youth in various fields. The potential of economic growth through 'Make in Northeast' initiatives was also highlighted. The session, which had footballer Baichung Bhutia as its special guest, witnessed the participation of a large number of students from the northeast as well as north India. Bhutia on his part said the people from the northeast have excelled in sports and lots of sportspersons have made the nation proud. "But at the same time, we need more support. I had to come and play in Kolkata and make my name outside of northeast. I think there has to be opportunities and we have to create that platform just in northeast so that they can make their name and get success by playing in northeast as well," said Bhutia. "We don't always need to come out of northeast to make a living, brand or name. It's important to create those kinds of facilities, infrastructure and opportunities in the northeast region itself," he added. Manisa, a student, said there is need to focus on developing the northeast region. "Since we don't find much development in our area, most of us go outside to try and find opportunities. Instead of that we should really start thinking of developing our own area and instead of trying to make more money, we should focus on developing our own area," said Manisa. Events like this help highlight the investment and development potential of the region, besides serving as a platform to bring people together to exchange ideas and address various impediments to growth.